But by another measure, it’s true that not much is happening at Fox News. Many of Ailes’s top lieutenants remain, including Suzanne Scott, who enforced Ailes’s short-skirt dress code; Warren Vandeveer, who installed the in-house surveillance system; and John Moody, who enacted Ailes’s right-wing news agenda. A high-level employee told me that Murdoch is adopting a policy of willful ignorance about the Ailes era and “doesn’t want to know” about the past. An organization like Fox News doesn’t become such a toxic workplace by accident. It happens only when management values profits and power structure over the fundamental rights of employees, particularly women and minorities who challenge that power structure. It’s telling that Bill O’Reilly was ousted only after public outrage caused advertisers to boycott his show. The question now is whether Fox News will do the minimum to appear to address the various scandals or make substantial cultural change. And whether substantial change is even possible under Rupert Murdoch, who has not historically shown that he cares much about management problems. After all, Murdoch must have known Ailes was a problematic executive when he hired him in 1996. Ailes had just been fired from NBC after an independent investigation found he’d made an anti-Semitic slur to a senior NBC executive. (Ailes denied it.) Murdoch later declined to investigate Fox News’ treatment of women after Bill O’Reilly paid $9 million to settle a sexual-harassment suit with former Fox producer Andrea Mackris in 2004. A year later, Murdoch sided with Ailes during a programming dispute with Murdoch’s oldest son, Lachlan, which resulted in Lachlan quitting News Corp. and Ailes moving into Lachlan’s office. After firing Ailes last summer — with a $40 million golden parachute — Murdoch claimed he didn’t know Ailes was paying out millions to secretly settle harassment claims. Murdoch has publicly said he wants to create a work environment based on “trust and respect,” but even after firing Ailes, he’s resisted cleaning house at Fox, battling his sons, James and Lachlan, who have wanted to make more sweeping changes. Last summer, Murdoch promoted Bill Shine and Jack Abernethy to serve as co-presidents despite the fact that Shine had enabled Ailes’s behavior for years and Abernethy had been accused of harassment by a former anchor. (Both men deny these allegations.) Murdoch also retained Fox News general counsel Dianne Brandi, even after it was reported that Brandi signed secret sexual-harassment settlements, including a $3.15 million payout to former booker Laurie Luhn. Earlier this year, Murdoch gave O’Reilly a new contract despite the fact that the New York Times had uncovered millions of dollars in private sexual-harassment settlements connected to the anchor. Murdoch similarly dug in when critics called for Shine’s firing. Sources say Murdoch changed his mind only to appease British regulators who will rule next month on his $15 billion takeover bid of the media company Sky. Inside Fox News, morale is sinking. “It’s the worst I’ve seen it,” a female manager said. Employees don’t know when the harassment and racial-discrimination lawsuits will stop. “I have people asking, ‘Are we having budget cuts to pay for sexual-harassment lawsuits?’ ” the manager told me. Employees wonder why Murdoch is allowing the slow drip of negative headlines to continue when he could answer them with a major change in management. Murdoch’s advisers argue he is making positive changes, appointing a new head of HR and hiring female executives to head the finance and advertising departments. Employees now must attend “sensitivity training” sessions. And Ailes’s pantsuit ban has been lifted. According to sources, Scott has taken it upon herself to encourage women to wear pants on air. Ailes loyalists continue to be moved out: Last week, Fox’s longtime head of graphics, Richard O’Brien, left when his job was eliminated in a reorganization. Still, in many ways, Murdoch’s response to this crisis at Fox News is following the contours of his reaction to the phone-hacking scandal that engulfed his British tabloids six years ago. Then, as now, Murdoch protected tarnished executives such as former Sun editor Rebekah Brooks. The phone-hacking episode forced Murdoch to shutter the 168-year-old News of the World and abandon his initial takeover bid for Sky. The price this time won’t be the closing of Fox News, Murdoch’s most-profitable asset, but for the first time in years Fox faces real competition. Last week, Sinclair Broadcasting announced a $3.9 billion takeover of Tribune’s TV stations, giving the conservative broadcasting company a coast-to-coast footprint. There’s speculation Sinclair could try to poach Sean Hannity or bring O’Reilly out of exile. Some wonder if a kinder, gentler Fox News can replicate the ratings success that Ailes’s authoritarian culture maintained for 20 years. Under Ailes, Fox anchors and executives marched in lockstep, keeping off-camera drama out of view and working together to sell Ailes’s point of view. Now Hannity takes to Twitter to accuse a colleague of plotting to get Bill Shine fired, and competition from the left and the further-right has left Fox News with a programming challenge. The Murdochs are quietly looking for a new programming executive to run the network. According to sources, James wants to recruit David Rhodes from CBS News (Rhodes is under contract). 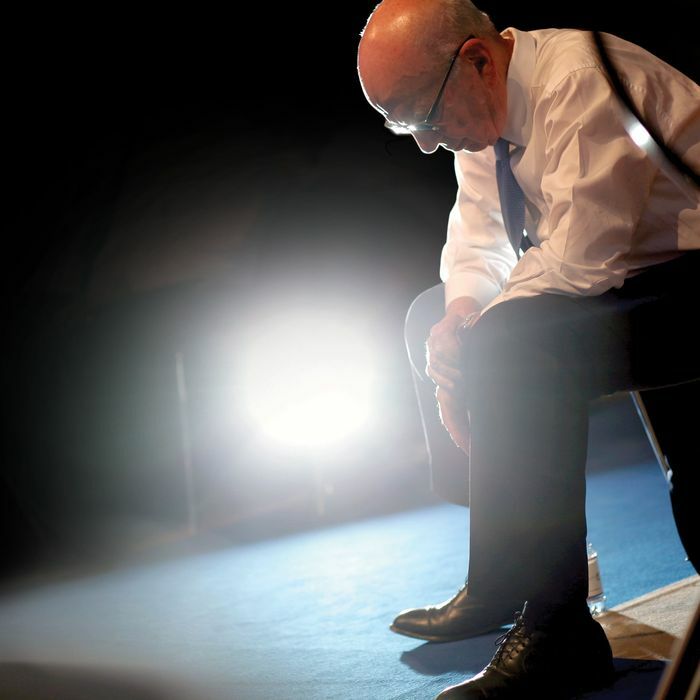 Rupert is interested in Wall Street Journal editor Gerry Baker, or Rebekah Brooks. One source said Rupert’s daughter Elisabeth is also being discussed as a candidate. Any of these hires would be a radical departure from Ailes, but none more so than Elisabeth. A seasoned television executive in her own right, Elisabeth has positioned herself as a firm critic of the scandals that have resulted from her father’s management choices. In 2010, her ex-husband Matthew Freud told the New York Times: “I am by no means alone within the family or the company in being ashamed and sickened by Roger Ailes’s horrendous and sustained disregard of the journalistic standards.” The following year, Elisabeth refused a seat on the News Corp. board to register her disgust at the phone-hacking scandal. She said phone hacking raised “significant and difficult questions” about how News Corp. “fell so far short of its values.” Elisabeth’s return to the fold would be a powerful signal that Fox News is entering a new era. But as long as her father is still running the show, Fox News will likely stay very much the same.